It has taken me a few days to calm down after the debacle at ANZ Stadium on Saturday night. But I am still angry. There has been lots of negative commentary about our performance, and yes, it was not our finest hour. Coach and players will no doubt be hurting and searching for a response quickly, because the show moves on and they need to front up again on Saturday. That is hard to do. The players who wear our national jersey have my undying admiration, and I really feel for each of them. Do I blame them? No. Winning is bloody hard, and the players know it better than anyone. Players don’t create the environment in which they play, they just get picked, turn up, and give it their best. How can we be spending more than ever on the growing professional arm of the game, but getting worse? I have gone back as far as I can into the ARU Annual Report archives, and can tell you that since 2007, the ARU has spent $777,000,000 on the game (in nine years). Almost all of it on the growing empires that are supposed to make us a rugby superpower. 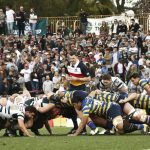 In that time, investment in rugby’s grassroots has fallen to pretty much zero. I can also tell you that not once since 2007 have the ARU spent less than they have earned. Yet we have beaten New Zealand six times in the last 38 matches, and not once in our last 18 attempts in New Zealand. Our Super Rugby teams this year won three games from 25 against New Zealand teams. Our under 20s finished sixth at the World Championships, which is about standard fare over the last few years. Yet if you look at any ARU Annual Report over that period, you will see nothing more than a glossy advertisement for all the great things that we should be so thankful for. It is corporate PR and spin, where reality has no place. It is classic corporate Australia, where people have places to hide, and people to blame. So why and how have we got here? And what is the answer? How is it that when we spent ZERO on the game, we were the best in the world, and now as we spend millions, we can’t beat time with a stick? First, there needs to be an acknowledgement that the current model is flawed. The modern sporting administrator is like a parrot, blindly copying those around them whilst earning big money and spending money which isn’t theirs, on things that equally unqualified people tell them are important. Think cricket, and more recently our Olympic team. Cricket is a terrific example. They spend more than rugby, and have a high performance unit whose sole job is to improve the weaknesses of our elite players. Like swing bowling in England, and spin bowling in the sub-continent. How is that going? You know how it’s going, it’s rubbish. But no one will undo it, because it’s too lucrative for those who are at the trough. 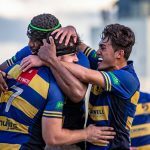 It is fair to say that as the “high performance units” at ARU headquarters and in the five Super Rugby teams have grown, and subsequent investment in rugby’s lower levels has dried up, our performance has been in decline. 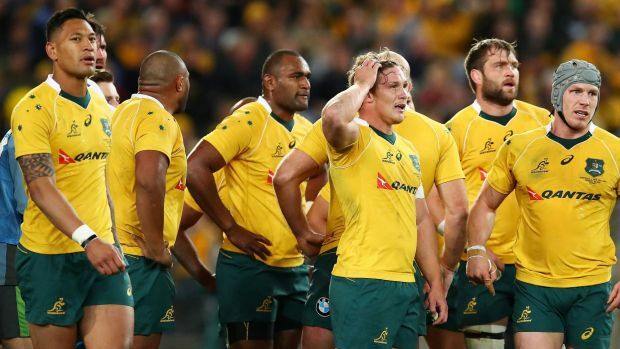 Further, the level of interest in the professional game, at Wallaby and Super Rugby level, has also been in decline. Crowds are down at every level, and TV ratings for most Super Rugby matches are poor. Not to mention that all five “franchises” lose money, consistently. It is obvious to me that as administrators give us more and more “product”, it becomes less meaningful to us. We are given more of it because it generates more money, which they are addicted to because they have empires to maintain. But we eventually stop caring, so they give us more, and the merry go round continues. But winning rugby matches is about culture. Players improve through learning the lessons on the way, and through adversity. High performance units, and the like, create an elite culture where kids start to think they are way better than they are in reality, and subsequently you get shortcuts. New Zealand have no shortcuts, because every kid in NZ knows with certainty that they can take nothing for granted, because there are many lining up to compete with them at every single step. If they slip up in any way; work ethic, attitude, skill development, they will miss the boat. It is not because of an “elite development squad” that a youngster makes his mark on the world sporting stage. It is because they have had a spark lit somewhere inside them and worked their backside off. For many of them, the paid servant of the game simply gets in the way, because they have to justify their job. Our best performers have a far greater knowledge of what it takes to succeed than those paid to teach them. But it starts as youngsters, and every step of the journey must be respected. The reason it is not like this in Australia is because the hierarchy doesn’t respect every step. They think you can build a house from the roof down. Those with the power and purse strings think you can pluck kids from school, and create elite players. What gets created in many cases is young players’ way ahead of themselves, who think that a cold night training with second grade is beneath them. But it is exactly these cold nights with second grade that creates the resilience and culture that wins Bledisloe Cups. Start by undoing. Be bold. Stop immediately spending millions on things that demonstrably don’t work. Close down the Super Rugby teams that eat money, and start building a culture that respects every step of the journey. Tell SANZAR that it’s over, and if it costs us money to get out, then who cares, because it is currently being wasted on the wrong things anyway. The simple fact is that we, the rugby public, don’t care anymore. It has become meaningless, and if you ever want to win again you had better start creating real meaning at every level. And if you can’t create meaning around the NRC, get rid of it. Money will still flow from matches that people actually care about, and it shouldn’t be too hard to create an annual interstate series that matters. Play the pacific island countries and some games against the best New Zealand teams if you must, but make it matter. By all means, reward our elite players for playing for Australia, or their state, but make it about winning, not just turning up. If they want to go overseas, let them go. Do you really think they can flood the European and Japanese market? Let’s be honest, they’re not that good! And if you make first grade rugby meaningful again, many will see it as a real step to a state and national jersey. 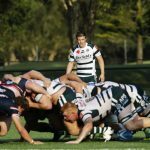 Of the $80+ million you plan to spend next year, spend half of it on the development of grassroots rugby, at junior and school level. Create competitions that are about nothing other than growing the game. And not about finding elite 16 year olds. Pay for it. Pay all junior registration fees and make a statement that you are serious about the future of the game. Pay the schools to take down the AFL posts, because the longer you stand idly by and do nothing, the more all our future Beauden Barretts, Aaron Crudens and Damian McKenzies will be playing other sports. Show some bloody fight, please! Make district rugby important again, because it’s a very important cog in the cultural pathway. National schoolboy and under 20 representatives should never think they have achieved anything other than being a step closer to first grade. 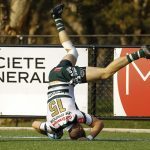 If you had been at North Sydney Oval or Ballymore on grand final day, you would have seen something special, something that really matters, and something that should be captured and bottled. It was this meaningful, tribal atmosphere that we are prepared to pay for and support. Top shelf players on all sides, and I venture to say I could pick a combined team from both grand final days that wouldn’t have been too far out of its depth last Saturday night. But what does the professional game do? They sign Curtis Rona to the Western Force! Some of those Norths blokes would eat him up. But the ARU were not there. They were sponsoring a race day at Randwick, and promoting the Bledisloe. On grand final day! That is how far out of touch we have let them become. And it’s time we stood up and let them know it is unacceptable. I am sick of being taken for a fool, and I hope you are too. Email the ARU if you are interested in having a voice, but be nice. I really believe we can turn it around, but not by doing more of the same. And meanwhile the NRC starts this week! Who knew?